For WCMD I am doing the challenges at A Walk Down Memory Lane. There are a LOT of them-nine. I did eight so far but I'm going to space out the posts because I may not make more cards for a while. I'm exhausted. So anyway here's the first one I did-it was for a recipe challenge. I had to use the following: 1 ribbon, 1 flower, 1 button, 2 pattern papers, 2 word sentiment like Happy Birthday, 3 brads, 3 circles. I'm not overly thrilled with this card but it's better than the first one I came up with (which was all this stuff, just arranged differently). Maybe I don't work well with all those rules. Oh this is beautiful! Reminds me so much of Laura Ashley!! 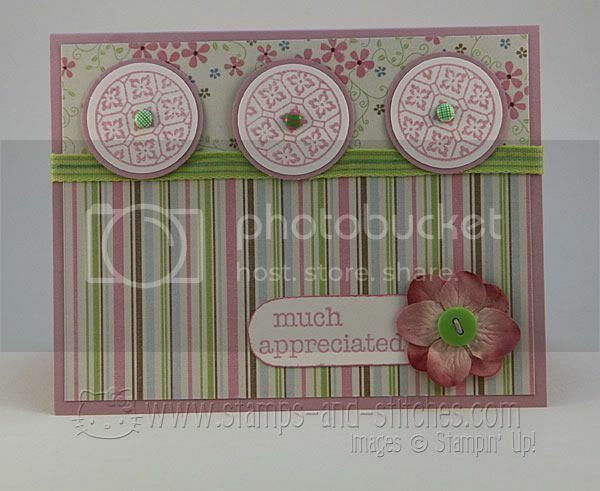 This is so pretty, I love the gorgeous papers and the soft feminine colours. Beautiful card. The colors are so pretty. Cute card! I just love those papers. Such yummy colors. Siobhan's right, it really reminds you of Laura Ashley. This is gorgeous. 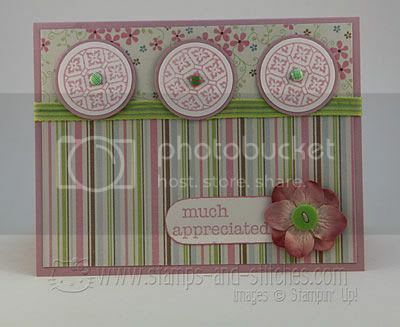 Incredible use of the circle stamps...I struggle to use that one, I won't now! Gorgeous!